This was a busy week in Brandline. Not only did we have the heavy snow causing several delivery issues, but we had several large orders that had to be with our clients! 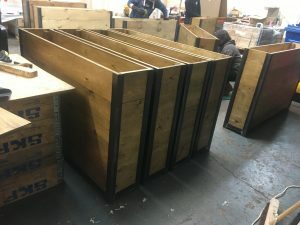 One of the orders was for large Cafe planters which were to be manufactured for a major client. As you can see from the image below there were quite a few of the planters that had to be made from scratch. 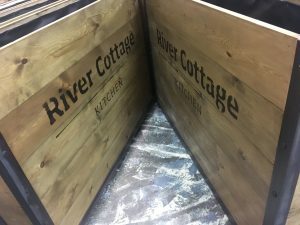 The planters were made from treated and planed timber which was subsequently stained with four coats of a heavy protective stain and branded to the clients specification. 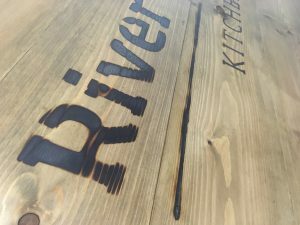 The branding was carried out using a full stencil and flame. The burning process is laborious and the main problem is that you only have one crack at it. Luckily, with experience comes expertise and we have had to carry out this process dozens of times. 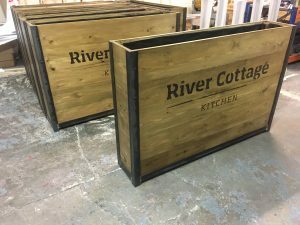 The frames of the cafe planters were manufactured from 5mm thick mild steel which has been left untreated to ensure that a rustic appearance will be evident within a few weeks. A false bottom was installed inside the planters to ensure that enough. but not too much, soil can be loaded. Like all wooden planters, there will be slight movement in the wood. To alleviate this, the wood installed was slightly shorter than the frame allowing the wood to “breath” as it needs to. The planters are actually based on the Baylis planter. Although these one are not as deep and are much higher. As the area is fairly windy, and the planters are to be a permanent fixture, it was decided that the casters will be replaced with legs. The final part of the process was the lining. This was industrially fitted ensuring that the life span of the planters are extended. Another piece of news this week is that we have now released the stain filter website as promised. 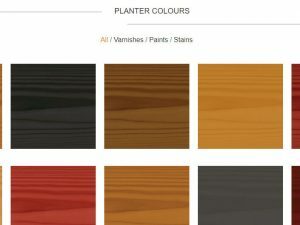 This show all of the approved colours and stains that we have tested for cafe planters and can use to supply. Select the image to view the website. 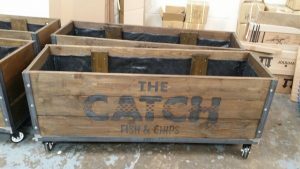 More images of the cafe planters will be posted as soon as we get them! This entry was posted in Cafe Planters, Uncategorised. Bookmark the permalink. ← Cafe Barriers – Canvas Colours.